Many wine drinkers love the experience of removing a cork from the bottle. But at least one in twenty bottles if not more is faulty due to problems with the cork used to seal the bottle. This is called "corked wine" and it is estimated that between 3-8% of wine bottles have the fault It's bad enough having corked wine with an everyday drinking bottle for $20, but can you imagine buying a Château Lafite Rothschild for $1000 and discovering the wine is bad. The normal cause of corked wine is TCA (Trichloroanisole), a naturally occurring fungus present in the bark of the cork tree or it is found in wood that has been in contact with some form of chloride chemical used as part of the process used to clean and sterilise corks. When Chlorophenols found in certain pesticides and wood preservatives, get in contact with wood, they can be transformed by fungi into TCA and other foul smelling molecules. Since wood is generally treated with preservatives to prevent rotting, the contamination from TCA can come from anywhere. 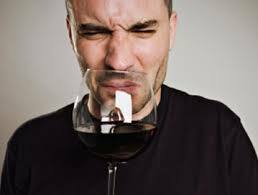 If TCA from wood or cork get close to wine, the unpleasant odours concentrate into the wine until it may eventually become ‘tainted’. TCA can also be found in badly cleaned wine making facilities or cellars and can contaminate wine before bottling if affected wood was present at the winery. Natural cork has been used to seal wine vessels for thousands of years and as glass bottles for wine became popular so did cork from around the 1600's. It is produced from the spongy substance taken from cork oak trees (Quercus Suber), which are largely found and cultivated in Portugal. The cork oak tree needs to be at least 25 years old before the cork can be harvested and can only be every nine years or ten years. The application of corks not only seals the wine in the bottle, but this also slows down the natural oxidation process, This allows aging slowly over time by allowing a minimal amount of oxygen into the wine. The amount of air which is exposed to wine is critical, some oxygen is needed to allow maturation (1 mg per year) and remove added sulfites (which act as preservatives and anti-microbial agents) but too much and you have a problem. Corked bottles smell musty, mouldy or of old damp (a strong smell of wet cardboard or wet newspaper) or intense mushroom odour. While corked wines are undrinkable, drinking a corked wine is not going to harm you if you drink it. Its just not going to taste pleasant. The corked smell gets worse the longer the wine is opened as it gets exposure to air. Infection can also cause the wines natural aromas and flavours to be muted and at its worst great wines can have no perfume and a non-existent palate. A slightly corked wine is tricky to detect as aromas and flavours will be impacted, but not in a dramatic way ,and some people are more likely to detect TCA than others. For these slightly affected bottles, only experts in the wine can identify a problem. Even then some people incorrectly state a bottle is corked when it isn't. Aged wine can develop some earthy and mushroom aromas that can be confused with TCA e.g. Burgundy Pinot Noir. How you can tell the difference is that without TCA, you should still smell and taste other flavours, the damp and mushroom don't dominate. TCA is amazingly potent. Only five parts per trillion of TCA in red wine can completely make it undrinkable and in white wine as little as 2 parts per trillion will ruin it. Because TCA occurs naturally it is virtually impossible to eradicate it from a winery without bleaching the whole operation and then even then it can return. To combat defective corks, producers are bleaching the corks with peroxide instead of chlorine as well as steam cleaning and washing the corks. A newer more expensive solution is carbon dioxide washing or using a cork barrier, which is a thin membrane fixed to the end of the cork by heat. A couple of years ago, Amorim, the world’s biggest cork producing company started using ND Tech (Non Detectable Technology) which harnesses gas chromatography mass spectrometry to find TCA infected corks and remove them. The technique can detect TCA showing as little as 0.5 nanograms of TCA per litre. Some winemakers use DIAM cork which is more TCA resistant. DIAM is made from natural cork but the cork is produced from small particles that have been glued together to form a cork instead of from sheets of cork. Ultimately TCA is a winemakers nightmare. If a bottle of wine is corked it needs to be returned to the retailer, assuming its been purchased recently and has not been in the cellar for years. The smell of corked wine is different to something called "brett" which is caused by an organism called brettanomyces, a naturally occurring yeast that is not harmful to consume yet can do both good and bad things to the aromas and flavours of wine. Wine makers call it the "B word" and brettanomyces can give wine complexity and depth: earthy and savoury flavours of tobacco, leather, wild game, smoked meat, truffle, clove, spice. When Brett turns bad, it can give wine the aromas of manure, wet dog, antiseptic, horse sweat, stable or even of vinyl records. As a result, many winemakers do everything they can to prevent Brett contamination. Brett is present after the fermentation of red wine when it’s ageing in barrel, particularly favouring ripe grapes with high alcohol and residual sugar, high pH and low acidity. Brett is not normally found in white wines because of their higher acidity (lower pH levels). Some especially in the Rhône wine region, encourage a little bit of it but many less drinkable bottles from many areas of the world can be caused by poor cleanliness in the winery which encourages the yeast to proliferate and contaminate wine. Some wines in France's Châteauneuf du Pape gives off horse, animal or barnyard aroma, which in small doses adds complexity. In larger amounts, it can overwhelm the wine - not good. Brett can occur naturally in the vineyard and winery and Old World reds from Bordeaux, Piedmont, the Rhône Valley, Rioja and Burgundy have the yeast which it is said contributes to the earthy notes associated with the terroir. Australian, New Zealand, South Africa and American wines have also been linked to Brett with tasters reporting unpleasant barnyard and burnt rubber aromatic notes. Many winemakers believe that Brett negatively impacts terroir, not the other way round but for traditional wine markers in areas such as Bordeaux it is seen as part of the fabric of winemaking. Peter Gago, chief winemaker for Penfolds in Australia, tells of the issues winemakers face in dealing with Brett: "We consider that if it is detectable, then it’s a flaw. Without wanting to get into detection and recognition thresholds, we think that the argument that Brett adds a touch of complexity has been historically overplayed and misleading." Penfolds has put many procedures in place to control it, remembering that just about all wines contain trace amounts of the yeast. Sulfites (SO2) can be added to grapes prior to crushing, used during maturation and added to the bottle and tanks and equipment should be thoroughly cleaned on a regular basis. Infected wine can be cleansed by filtering, dosed with sulfite or even treated with Velcorin (dimethyl dicarbonate (DMDC)). Who wants Velcorin in their wine though. Sulphur dioxide added to wine helps maintaining the Brett at a low level and it is one of the key reasons SO2 preservative is added to wines. However, for natural wine makers who can't use filtration or SO2, you can see the sort of challenges they face as Brett is so ubiquitous. Most winemakers, especially in the New World, wouldn't even like to mention the Brett word if its in their wines as critics can dismiss their wines as faulty in tastings. "don’t ask, don’t tell’ - don’t ask me about Brett, and I won’t have to tell you that it’s in my wine. But its difficult for expert tasters. A typical Burgundy Pinot Noir can be described as earthy and typical of the terroir but a taster can declare the wine impacted by Brett and undrinkable, a position which can only be resolved by laboratory testing. In Pinot Noir, Brett can cause loss of fruit notes and can distract from the usual characteristics of the grape if the wine is too leathery. So there is a huge debate in winemaking circles whether Brett is good or bad and by wine region. It is largely up to individual taste and like corked wine there's no way to tell whether one bottle, one case or even a whole vintage is impacted. Reduction is the opposite of oxidation which occurs as a wine matures and happens if there isn't enough oxygen. Since wine and especially red wine contains anti-oxidant molecules including resveratrol, they absorbs oxygen and give associated health benefits. However during fermentation when yeasts convert sugar to alcohol, they need a little oxygen. If there is no oxygen, because the winemaker didn't aerate the wine sufficiently, yeasts produce cabbage or eggy smelling sulfur compounds or aromas of rubber or burnt plastic. The impact of these bad aromas can be reduced by decanting the wine. Some sulphur compounds are so called Mercaptans which are bound with other molecules in the wine. Merceptans arise when a wine which has had too little oxygen wine is bottled with all the reductive compounds in it and without prior aeration to solve the problem. The small sulphur molecules react with bigger aromatic compounds in the wine and bind with them. Mercaptans can smell like onions, cabbages and onion. Copper coins can be used to bind with these molecules and eliminate them but who wants copper coinage in their wine. Volatile acidity or V.A. as winemakers refer to it is caused by volatile acids (acids which evaporate when heated) which primarily come from the oxidation of alcohol by acetic bacteria which turn the wine to vinegar. Nail varnish is composed of VA's so the smell is similar but also the spell is very close to wine vinegar used in cooking.